A former Army commanding officer has been accused of lying to a public inquiry into the death of an Iraqi civilian in his soldiers' custody. Colonel Jorge Mendonca said he saw nothing out of the ordinary when he checked on hotel worker Baha Mousa and his colleagues after their 2003 arrest. But Rabinder Singh QC, counsel for Mr Mousa's family, questioned his account of events in Basra, southern Iraq. He told the inquiry he must have not visited or had seen a "horrific scene". Mr Mousa was held by the 1st Battalion the Queen's Lancashire Regiment in a temporary detention facility (TDF) with Iraqi colleagues. The 26-year-old father of two died in British Army custody on September 15 2003, having suffered 93 separate injuries. Col Mendonca, the former commanding officer of the regiment, told the public inquiry in February that he had visited Mr Mousa and the other men held with him on the evening of Sunday September 14. In a statement, he said: "If I had noticed any injuries to any detainees or any of them appearing to be in any distress I would have immediately queried the situation. "However, there was nothing that alerted me to any type of problem." In his closing submissions to the inquiry on Monday, Mr Singh raised questions about Col Mendonca's role in the abuse of Mr Mousa and other detainees. He alleged the Iraqi prisoners were beaten by soldiers in the group, known as a "multiple", led by Lieutenant Craig Rodgers, before Col Mendonca claimed to have made his visit. He said: "It's not just that he [Col Mendonca] was in overall charge and therefore must take responsibility for what happened on his watch as commanding officer. "His evidence in effect was that the detainees were quiet and there didn't really seem to be anything worth troubling about. "Either of two conclusions may be possible - that he has not told the full truth about what he saw because he must have seen a horrific scene and he should have done something about it. "Or that he never went, as he claims to have done, and realised after the event that he should have done." Mr Singh agreed with inquiry chairman Sir William Gage that the second possibility was more unlikely. He said evidence to the inquiry showed many people passed the detention facility while Mr Mousa and the others were being abused, and that was indicative of the general environment at the detention facility. Mr Singh said: "Many people at least could, and probably did, hear the abuse taking place, and that again tells one something about the culture of impunity the perpetrators seem to have felt." Mr Singh singled out evidence to the inquiry that the Iraqi detainees were forced to scream in an orchestrated "choir". "It is perhaps a terrible glimpse that we have seen at this inquiry of what human beings are capable of: an insight into our heart of darkness," he said. The inquiry, which started public hearings in 2009, was told British soldiers used "conditioning" methods on Iraqi prisoners such as hooding, sleep deprivation and making them stand in painful stress positions. These techniques were outlawed by the UK government in March 1972 after an investigation into interrogation in Northern Ireland. But Timothy Langdale QC, counsel for Col Mendonca, said Mr Singh had made "wholly unwarranted" claims about his client. He said in a written submission to the inquiry: "Those suggestions should plainly be rejected." 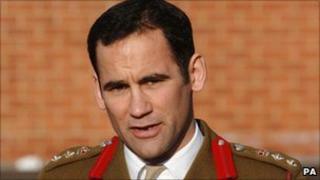 Col Mendonca became the most senior British officer to face a court martial in recent history when he was charged with negligently performing a duty in relation to the abuse. He was cleared in February 2007 and left the Army seven months later, saying he believed he had been "hung out to dry" and made to feel like a "common criminal" by his commanders. The inquiry will hear further closing oral submissions this week. In October it will look at the lessons learned since 2003 and Sir William is expected to publish his report later in 2010.